DeAndre Jordan wants to play for his hometown and the Rockets could certainly use him, but it’s much more complicated than that. 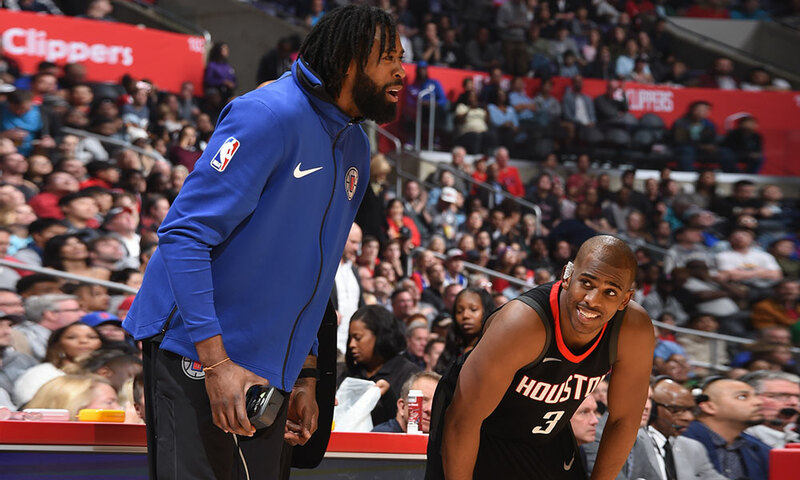 Recent news about DeAndre Jordan being interested in joining the Houston Rockets, combined with rumors that the LA Clippers are possibly interested in moving Jordan ahead of the February 8 trade deadline, has led to a great deal of speculation within the Rockets community about the viability of Houston adding Jordan, either prior to the deadline or later this summer. Unfortunately for those clamoring for a reunion between Chris Paul and his former Lob City partner, it is not very feasible in either circumstance under the NBA’s salary cap rules for the Rockets to acquire Jordan, who makes about $22.6 million this season and has a $24.1 million player option for 2018-19. Jordan’s high salary makes any in-season trade difficult for the Rockets to accomplish. Any realistic trade for Jordan would naturally start with Clint Capela, but his cap figure — in the final season of his rookie scale salary — is only $2.3 million. As a championship contender, Houston does not have many large salaries with which it can afford to part. Ryan Anderson (making $19.6 million this season) could provide the necessary matching salary, but Anderson’s contract (which includes another $41.7 million over the two seasons after this one) is widely viewed as a negative asset. A package including Capela and Anderson may not be enough to entice the Clippers to move Jordan to Houston. Additional assets might be needed, and/or the Rockets might need to take on additional salary from Los Angeles. But with Houston only about $2.6 million below the luxury tax, taking on more salary may not be palatable for the Rockets. Further complicating matters is that adding Jordan now could preclude the Rockets from being able to add a superstar (namely, LeBron James) this summer. If Jordan opts in to his current deal, that would mean $24.1 million less in available cap room for Houston to use to pursue other free agents. Also, in the more likely event that the Rockets seek to add that superstar via trade — since Paul and its other free agents’ cap holds will probably leave Houston with little to no cap room anyway — not having Anderson’s contract for salary matching purposes would make any such trade exceedingly difficult. For instance, if LeBron opts in to his current contract ($33.3 million this season, with a $35.6 million player option for 2018-19), no realistic combination of player salaries would be enough to acquire him via trade without including Anderson’s contract. Perhaps if Jordan opts in to his deal, he could be included, but there is no way for the Rockets to know now whether that will happen, plus the Rockets would be without a starting center. Maximizing any chance of adding a LeBron James is paramount. With Capela playing well this season — and with his cap hold being a mere $7 million this summer — any perceived upgrade from him to Jordan should be greatly outweighed by the loss of assets and cap flexibility that Jordan’s acquisition would create. Perhaps if the Rockets strike out on more prominent free agents, and if Capela receives an offer sheet too rich for the Rockets to match, they could then pursue Jordan. But that should be a contingency plan at best. At least for now, Rockets fans should put hopes of adding DeAndre Jordan aside and focus on this team’s run for a championship.